The Panthéon is the delight of every architect, as it is an exceptional neoclassical edifice that serves as the resting place for individuals who have achieved outstanding feats and proved to be illustrious citizens of the French nation. 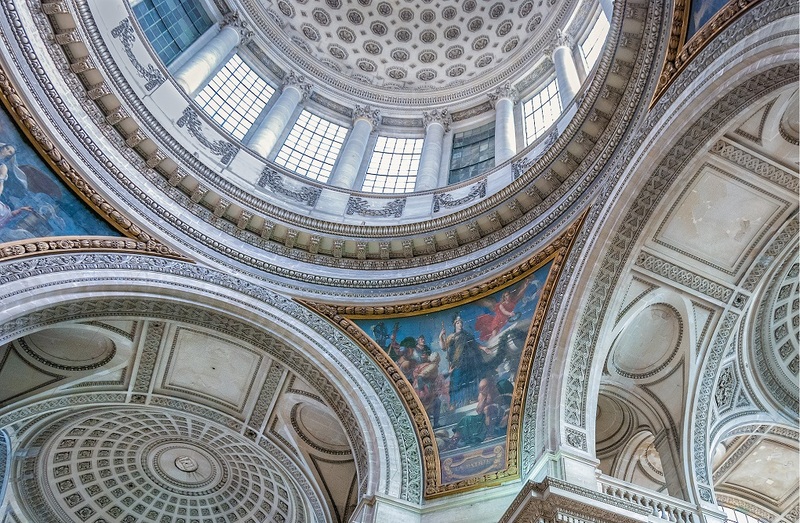 The building process of Panthéon started after the recovery of King Louis XV in 1744 because he has vowed to rebuild the remnants of Sainte- Geneviève in Paris’s Latin quarters if he recovers from his ailment. Construction work started in the year 1758 when France was experiencing financial difficulties, but by the time of its completion in 1789, a political revolution has evolved in France and has changed the political scene of the country significantly. Under the new revolutionary government, the Pantheon was converted to a “Temple to Reason” where it would no longer be used for religious activities, but as a mausoleum for the most celebrated French intellectuals who have contributed their quota to the French nation. During the 19th century, the center was converted to a religious edifice on two occasions as it was utilized as a church from 1828-1830, and 1851-1870, but it was later converted to a mausoleum where people can visit and see the splendor of the building. The Pantheon is currently used as a civic building where the remains of illustrious French citizens such as Voltaire, Jean-Jacques Rousseau, Victor Hugo, Èmile Zola, and Marie Curie are preserved. Started by the renowned architect, Jacques-Germain Soufflot to rebuild the Church of Church of Sainte-Geneviève, Pantheon is a depiction of the return of Neoclassical to the use of traditional architectural components. The building is a cruciform building with a high dome over the crossing and lower saucer-shaped domes which are concealed by a slanting roof over the four arms. Its beautiful façade sharing a resemblance with the Roman Pantheon is created by a porch of Corinthian columns and triangular pediment linked to the endpoints of the eastern arm. As a first-time visitor to the Pantheon Paris, you will marvel at the interior part of the building. The internal section is adorned with mosaics and paintings of the scenes of the rich history of France. There are sculptures by Pierre-Jean David d’Angers of post-Revolutionary patriots in the pediment. The roof’s exterior is in three phases with a stunning dome over a colonnade of columns. The exterior porch took its design model from the Roman Pantheon and had ornate sculpture and 22 columns. You would be captivated by the magnificent interior design of the Pantheon. There is a Greek cross in design with a gigantic cupola and dome over the crossing; the interior part has 52 fluted Corinthian columns and 72 engaged pillars. After its conversion into a Pantheon for the interment of distinguished citizens of France who has served the nation faithfully. The dead bodies of these individuals are interred in the large crypt, and when the building was altered, about forty-two big windows were closed leaving the interior side cool and dark. As a visitor to this tourist destination, you will gain more knowledge about the rich history of the French people. You will have an idea of the impact of the revolutionary government on the monumental building, and the relevance of the Pantheon in contemporary France.